Dovetail Quick Release Base plate fr 15mm Rod Support Rail DSLR Rig Follow Focus. How to mount the item / What the item contains. 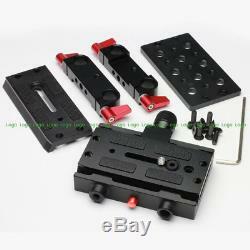 With various types quick release plates or tripods. Include 2 quick release plates and 1 cheese plate. One plate compatible Manfrotto 701HDV/501PL quick release system. The other one compatible with Giottos MH-621 quick release system. If you have other types of quick replease plates or tripods, the cheese plate can meet your needs. 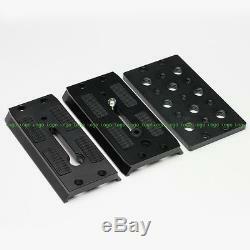 4 mounting holes on both quick release plates allows you make one of them as bottom plate to fit quick release system. 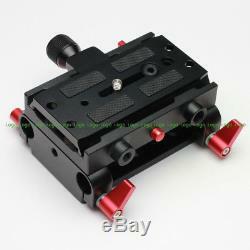 Specially designed active block, you can mount the compatible. 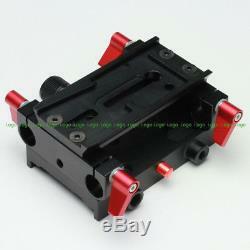 501PL quick release plate or the compatible MH-621 quick release plate. With the 1/4"-20 mounting holes and 3/8" mounting holes in clamp base, you can mount it on to tripod, quick release plate or stabilizer, camera dolly, jib crane directly without 15mm rod clamp. Enhanced tripod mounting Support Quick Release Plate BasePlate rod clamp kit, comes with two rod clamps / rail blocks, make it stronger. For 15mm rod support film industry standard. Red rotating lever knob screw lock design allow you lock the quick release when you can not turn the screw by 360 degree. 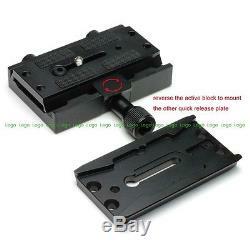 Dovetail Quick Release Base plate. Fits standard 15mm rod / rail support system. 15mm rods spacing:60mm(center - center). Glass bead blasting and anodized finish. 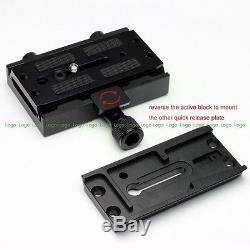 1 piece of compatible 701HDV/501PL quick release plate. 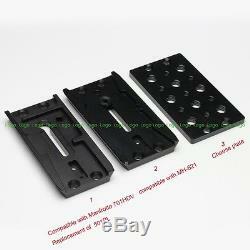 1 piece of compatible MH-621 quick release plate. 1 piece of cheese plate. 1 piece of clamp base. 2 pieces of rod clamp with rotatiing screw knob. 8 pieces flat head screw. 1 piece of allen key. Customers Who Bought This Item Also Viewed. 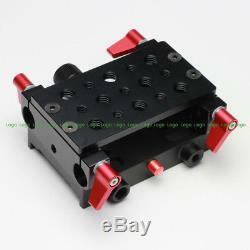 Folding Shoulder Pad Rod Clamp Mount Kit fr Follow Focus DSLR 15mm Rail System. NP-F970 Battery Power HDMI to SDI Signal Converter fr Rig Armor Cage Stablilizer. ARRI Standard Rosette Extension Arm fr Sony FS7 FS700 Handle Remote Grip Handle. 3 month guarantee from me(from date of sale). Your satisfaciton is most importatnt to me, I depend on your satisfaction to suceed. 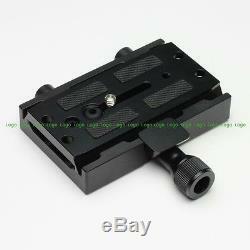 The item "Dovetail Quick Release Base plate fr 15mm Rod Support Rail DSLR Rig Follow Focus" is in sale since Tuesday, June 03, 2014. This item is in the category "Cameras & Photo\Film Photography\Movie Camera Accessories".ogo" and is located in Tsim Sha Tsui. This item can be shipped worldwide.